Advice on choosing the right snorkel for you. The snorkel is simply a curved tube that lets you breath while floating face-down on the surface of the water. When scuba diving, it is used to conserve air in your cylinder while on the surface. They also offer hours of enjoyment for snorkelling in the shallows allowing you to keep your head underwater. There are also snorkels especially for freediving and spearfishing. A good snorkel for scuba diving or snorkelling certainly needs to have a purge valve at the bottom. This aids clearance of the snorkel and will make snorkelling a much more pleasurable and easy experience. It is also good if it has a wave deflector or chamber mechanism at the top which will help to prevent wave splashes entering the snorkel too readily. 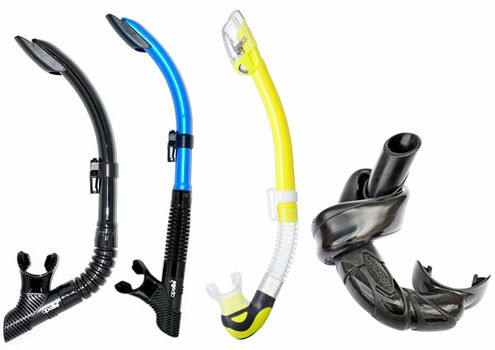 For a large range of Snorkels for all conditions and activities, please visit the Scuba Diving Snorkels, Snorkelling Snorkels, Freediving Snorkels, or Spearfishing Snorkels, sections in the The Scuba Doctor Dive Shop. This is a one-way valve that allows water to be cleared from the snorkel from the lower end, thus reducing the effort Required for clearing. In certain snorkels, the valve is located directly below the mouthpiece; others incorporate a shotgun design with a valve on a separate branch from the main tube. Many modern snorkels incorporate a system that reduces the amount of water entering the open end, for example if a wave washes over your head known as a wave chamber. Older people recall a ping pong ball on the top of a snorkel to stop any water entering the tube, but this system is no longer available. A flexi-tube on the snorkel mouthpiece keeps the snorkel out of the way while underwater, and can be bent back round to the most comfortable position when Required. Better snorkels have a corrugated flexi-tube but the inside is smooth so the air flow is not disturbed making each breath much easier. Often with higer quality snorkels the parts are individually replaceable, whereas with more basic models you would have to replace the whole snorkel. Some snorkels are designed to fit into a BCD pocket when not in use. Many experienced divers either don't carry a snorkel with them, or have a foldable snorkel in a BCD pocket. Snorkels are all available in a variety of colours in order to match your mask and the rest of your gear. Choosing an easily seen colour is also a safety consideration. Most technical and DIR divers believe snorkels are best left on the boat/shore. While snorkels are useful while on the surface, during a dive they are typically in the way. In most types of overhead diving environments snorkels pose an entanglement threat.